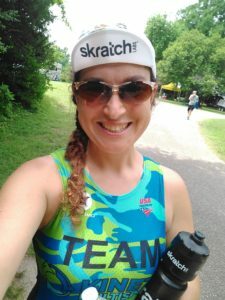 I’m Kristen and I’ve been racing triathlons since 2007. I absolutely love the sprint distance races. This allows me to spend more time on race day meeting other triathletes, and the opportunity to do 10 or more races each season. One of my favorite things about the triathlon community is how people are so friendly and willing to help each other out. I started running in high school and picked up cycling while working as a personal trainer and spin instructor after college. A few years later, I gave swimming a try and have been hooked on triathlon ever since. My first race was Giant Acorn and it continues to be my favorite race every year. I was clueless during that first race (attempting to pull spandex bike shorts over wet legs and taking several minutes just to remember how to tie my shoes), but that didn’t stop me from having an incredible time out there. Thankfully, there were people around who gave me pointers and advice and I continue to get faster and wiser every time I race. I live in Northern Virginia and am stoked that my daughters are participating in kids triathlons now too! You will hear my car coming on race day because I’m the one blasting 90’s music to get pumped up! I can’t wait to meet you out on the course this season!